Home » Sample Papers » Archive by category "Sample Paper Accountancy 12"
Accountancy Paper 2013 No. 10.pdf Accountancy Paper 2013 No. 11.pdf Accountancy Paper 2013 No. 2.pdf Accountancy Paper 2013 No. 3.pdf Accountancy Paper 2013 No. 4.pdf Accountancy Paper 2013 No. 5.pdf Accountancy Paper 2013 No. 6.pdf Accountancy Paper 2013 No. 7.pdf Accountancy Paper 2013 No. 8.pdf Accountancy Paper 2013 No. 9.pdf Accountancy Paper 2013 No.1.pdf Related posts: Sample Paper of Accountancy for class 12, CBSE. Sample Paper of Accountancy for class 12, CBSE. 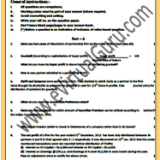 Sample Paper of Accountancy 2014 for class 12, CBSE. 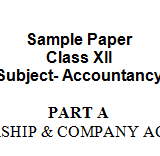 Sample Paper Accountancy Part A (PARTNERSHIP & COMPANY ACCOUNTS) for class 12, CBSE.